Many disabled people dreaded travelling on public transport in the past because of the lack of facilities for wheelchairs. But things are now improving for them. 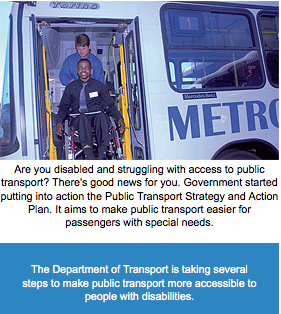 Through the Public Transport Strategy and Action Plan of 2007, the Department of Transport is taking several steps to make public transport easier for people with disabilities. This is done in partnership with provinces and municipalities. The Department has already started a number of trial projects. 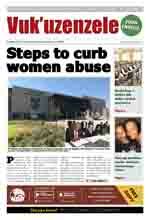 These include the Sukuma Project in eThekwini Municipality and the Dial-A-Ride in Cape Town. The South African National Taxi Council (SANTACO) and council members in the nine provinces are working with municipalities and transport authorities to make taxis accessible to disabled people. Several taxi associations in different provinces have already introduced vehicles specially adapted for people with disabilities. New taxis will be built in such a way that people in wheelchairs can easily get in and out. All new taxis that have been specially adapted to accommodate wheelchairs, must have clear signs that say they are certified to carry wheelchair users. The City of Johannesburg already has a public transport plan in place that is user-friendly to people with disabilities. For example, the city has several routes where buses stop at disabled people's organisations. These include the Soweto Workshop for the Blind, the National Council for Persons with Physical Disabilities, and special schools. Public buses will be fitted with special ramps. The City of Johannesburg's Metrobus service already has in its fleet 15 low-floor, wheel-Easier TRANSPORT for DISABLEDchair-accessible buses. This means the floor at the entrance of the bus can be lowered to street level to allow wheelchairs easy access. In the case of high-floor buses, the Action Plan proposes that the buses be fitted with mechanical hoists. Buses will also have things like hand rails and special areas inside for wheelchairs. In KwaZulu-Natal, the provincial education department bought 58 new buses worth R55 million to transport deaf and mentally disabled children. The department bought the buses because it was difficult for learners with special needs to take public transport to school. Seventeen of the 58 buses were handed to schools around Durban in November last year.